Hancock in the aftermath of the great fire of 1869. April 11, 1869 was a Sunday. Many residents of Hancock woke up and went about their regular routines in the early dawn hours: cooking breakfast, dressing for church, wishing for a little more sleep. Who could have suspected that normal life was about to take a long hiatus? The loss of the saloon would have been tragedy enough for its proprietors. Unfortunately, a minor catastrophe quickly escalated into a major disaster. As with most newborn mining settlements, Hancock’s buildings had primarily been constructed from wood. Worse yet, the wind was blowing from the northwest, swiftly fanning the fire east and south into the heart of town. “In less than half an hour,” wrote the Gazette, “there were half a dozen buildings in flames” on the saloon’s side of the street, “and soon those on the other side caught from the intense heat, and burst out with unexampled fierceness.” In modern firefighting parlance, Hancock had flashed over, a particularly vivid and appropriate term for the rapid spread. Hancock had prepared to fight a fire, but its people had not anticipated a blaze on this scale. The town had a modest water reserve (Portage Lake was frozen) and an even humbler municipal firefighting apparatus, underwhelming even by the technology of the time. Within half an hour, the water had run out without abating the flames that had already engulfed at least thirty-five structures. The fire continued to spread, forcing inhabitants to flee as it consumed building after building. “The air was hot, suffocating, and thick with blinding smoke–now settling down like a pall over the whole town,” explained the Gazette in an attempt to recreate the horror of the scene. When the winds did lift the smoke a bit, the frightened refugees glimpsed “broad sheets of flame from fifty to five hundred feet in length, and reaching, at times, almost the clouds.” No one whose home or business stood in the way of the blaze entertained any hope that the buildings would be saved. Instead, they banded together to try to rescue the contents. Store owners “tumbled their stocks pell-mell into the streets, and hundreds of willing hands conveyed them speedily, if not very tenderly, beyond the apparent danger.” As the fire’s path became even more ambitious, even the safe places where these goods had been taken had to be evacuated. The smoldering remains of Hancock after the fire. Photograph looks north. About six hours after they had broken out, the hungry flames found no fuel left for them to consume, and the roar of the blaze slowly died down to quiet smoldering. “Nearly all that remained of the once thrifty village of Hancock was an immense heap of embers, covered with a stifling cloud of smoke,” said the Gazette. Some modest buildings formed “a small fringe” along the northwest part of town, where the fire had started; two churches (St. Anne’s and the Methodist congregation) and two public halls that still stood among the ashes must have seemed towering by comparison. Among the estimated twelve acres scorched were some 130 houses and “every store in the town.” Rebuilding would be a massive process. 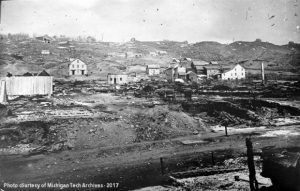 One cannot help but see parallels between the Hancock fire of 1869 and the flash flood of 2018 in the community’s responses to each. “The people seem to have accepted the situation, and have gone to work with a will,” the Gazette explained in 1869. Their words might as well have been written in 2018. Within a matter of days, Hancock residents and their neighbors had erected the beginnings of more than two dozen temporary structures where the burned ones had stood. Photographs taken of Tezcuco Street later in the year showed a maze of new buildings and framework lining each side of the road; piles of lumber in the middle of the route stood ready to finish the work. Although those who had lost homes and businesses no doubt suffered and continued to struggle, they also fixed their eyes on the path ahead and let their persistence carry them through. Neighbor helped neighbor; friend reached out to friend. Slowly, the normalcy that had existed in the early morning of April 11, 1869 returned. Today, Hancock bears little resemblance to either the town that existed before the great fire nor the town that rose, phoenix-like, from the ashes in its immediate wake. Survivors of Hancock in its pre-1869 infancy remain, however. Along Hancock Street (the southbound portion of US-41 in town) sit the O’Neill-Dennis Funeral Home and a residence bearing a “CELTIC HOUSE” plaque. As the parsonage of the Congregational Church in Hancock and the residence of Dr. W.W. Perry, respectively, both endured the fire and testify to the endurance of the city. The municipal government also makes available the New York Times reprint of the chronicle of the blaze. 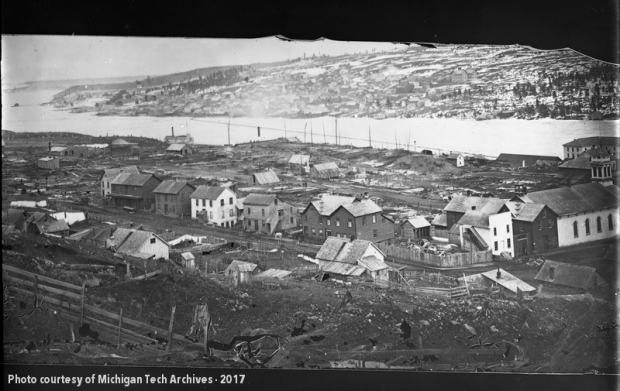 These, along with archival materials and books available at the Michigan Tech Archives, tell the story of a town that won’t go down without a fight. Want to know more about the fire of 1869? John S. Haeussler’s 2014 book “Images of America: Hancock” provides the most complete collection of photographs showing the before and after, as well as detailed captions that helped to inform this blog post. 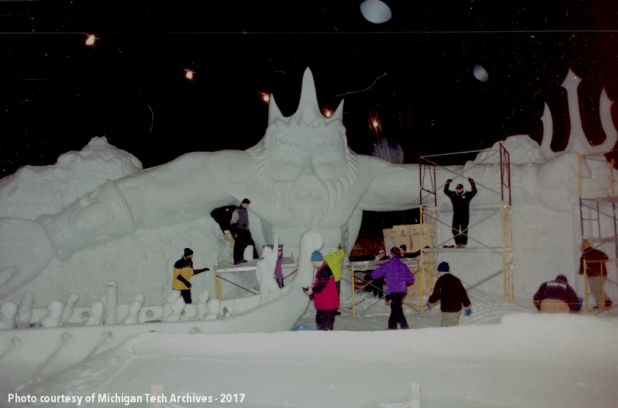 Today’s Flashback Friday celebrates all things Winter Carnival with this image from on this day in 2001. Students work diligently to finalize their statue just as our campus community saw a few nights ago during the 2019 all-nighter. Winter Carnival is a time-honored tradition here at Michigan Tech, with its beginning taking place back in 1922 when the Student Organization presented a one-night show called the “Ice Carnival.” The show consisted of acts, whimsical displays and performances put on in the traditional circus style, with students in an assortment of costumes. The show was held in the old Amphidrome ice rink, so of course the carnival also included ice skating events, including speed and figure skating contests. The circus theme continued for the next two years and, behold, the tradition was born. The carnival progressed and made changes as the years went on, with the addition of a Carnival Queen competition and the parade in 1928. There is film footage of the 1928 carnival available on YouTube. A glimpse back at Winter Carnival Queen Candidates. 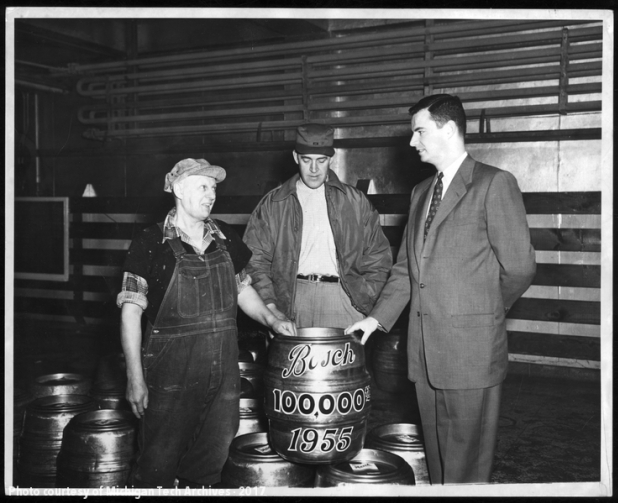 After 1929, there was a lapse of a few years, but in 1934 the Blue Key Fraternity took over the sponsorship of the festivities and put one on that year. The Winter Carnival of ‘34 looked more like the carnival of today, with a two-game hockey series, a parade, skiing, skating, and snowshoe races, and a dance. The focal point of carnival was the parade, with Greek organization, campus societies, and other student organizations developing elaborate floats. 1936 was the debut of the snow statues, which were built by students and student organizations, as well as local school children. As information on the building methods was passed on from year to year, the statues became bigger and more elaborate, with fine detail work and inclusion of ice art. 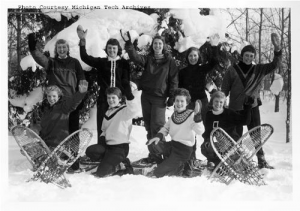 Decades, and nearly 100 years later, Winter Carnival continues to be a most treasured time of year for Michigan Tech. This year’s theme is “Years of Innovation STEM from this Snowy Situation.” For more information about activities, contest results, and more, please check out the official Winter Carnival website. 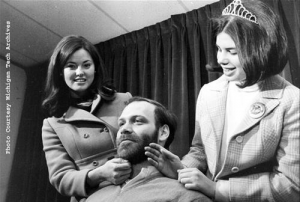 A glimpse back at the Winter Carnival Beard Competition. The Michigan Tech Archives will be open for Second Saturday during Winter Carnival from 12 p.m. to 5 p.m., Saturday, February 9. 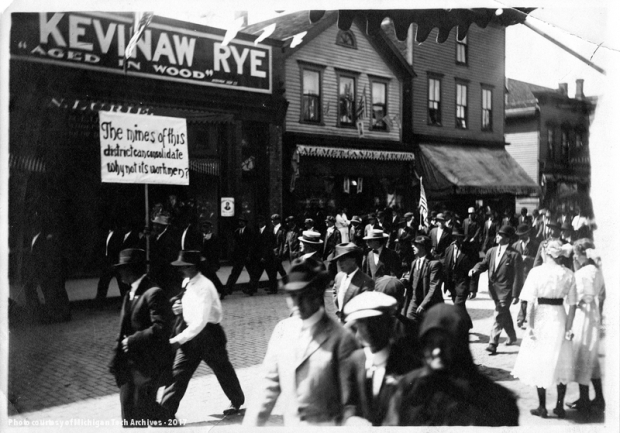 Take a break from statue gazing and stop in to see some memorabilia and photographs from Winter Carnivals gone by. 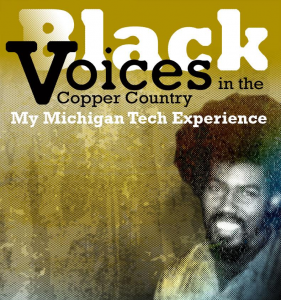 For more information, please call the archives at (906) 487-2505 or e-mail copper@mtu.edu. Tamarack No. 2 shaft buildings pictured in 1892. 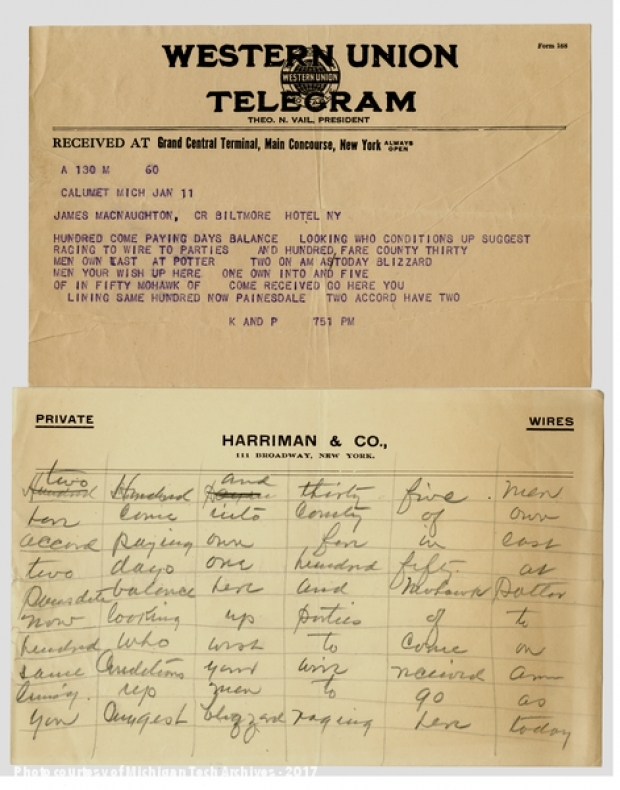 An employee walking to work at the Tamarack mine in early October 1901 would have seen the same landscape he saw every day: smokestacks coughing fumes into the air, mighty logs waiting to be hewed into shaft timbers, tall industrial structures silhouetted against the autumn sky. Everything would have seemed normal to him, the prelude to another regular day. Yet the Tamarack was not an ordinary place, and joining the employee at work that day were several men about to do something especially unusual, something that would raise eyebrows for years to come. The Calumet & Hecla Mining Company (C&H) had already proven the richness of the Calumet conglomerate lode when the Tamarack Mining Company was organized in 1882. Hamstringed by C&H’s property holdings, other mining investors desperately spent years seeking some way to tap into the lode and the profits. Time after time, they fell short. Then, finally, one had an epiphany. John Daniell was the superintendent of the competing Osceola Mine and a crafty mining engineer, and the plan he devised was entirely in keeping with his line of thinking. Daniell knew that copper lodes did not follow strictly vertical paths. A sketch of the geography of the Calumet Conglomerate lode, 1931. Rather, they ran under the earth’s surface at angles. C&H might own the land with the easiest–and most economical–access to the Calumet conglomerate lode, but their holdings couldn’t possibly cover the whole deposit, especially thousands of feet underground. With the cooperation of some notable investors, particularly Joseph W. Clark and A.S. Bigelow, Daniell and the Tamarack Mining Company drove five deep shafts at the very western reach of C&H property. Eventually, they hit copper–and paydirt. The Tamarack lands proved to be remarkably profitable, and the mine flourished. 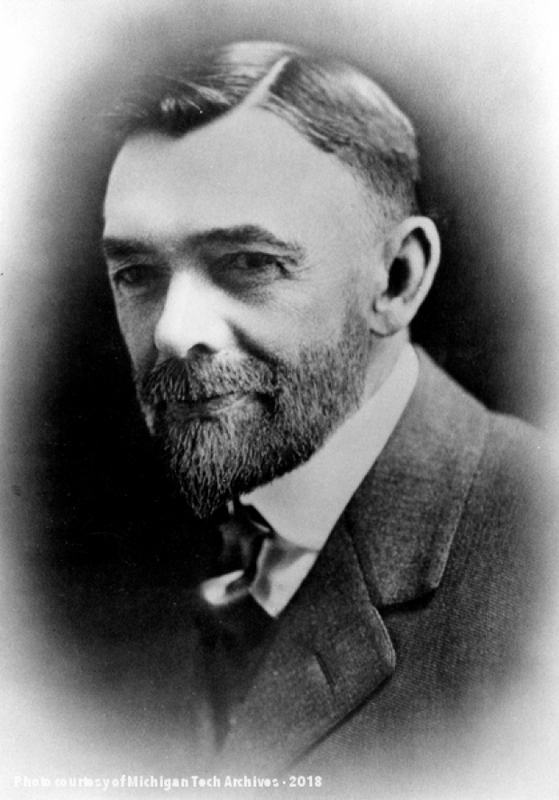 Daniell’s strategy of plunging deep into the earth was also precisely what allowed the Tamarack to become a massive laboratory. In October 1901, scientists and engineers from the company and from a certain local mining school gathered to study magnetic attraction, gravitational forces, and the behavior of pendulums underground. 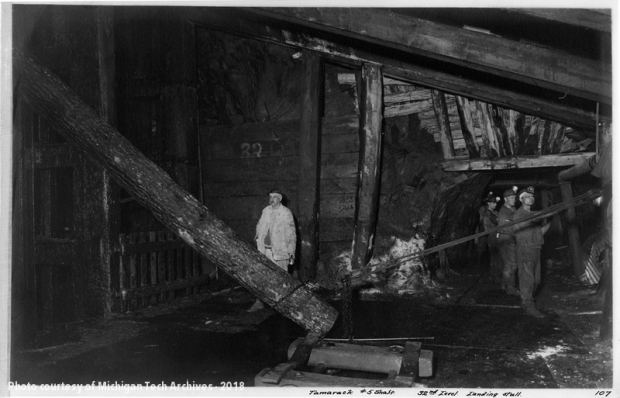 The Tamarack mine shafts afforded them an unprecedented opportunity. How often, after all, did an experimenter have the chance to work with a plumb line over 4,200 feet long? Since the employees of the mine had already done the dirty, backbreaking work of excavating nearly a mile into the earth, the shafts could serve a dual purpose. 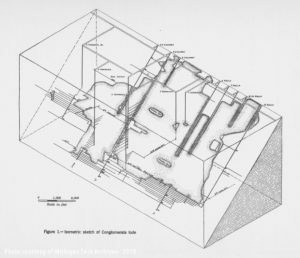 To keep the description succinct, in short the experimenters expected that two plumb lines suspended in a mine shaft would be nearer to each other at the bottom of the line than at the surface. The earth is convex (curved on the exterior), so the plumb lines would be drawn together as they descended toward the core, allowing a precise calculation of the angle the planet’s convexity caused convergence. If that line confused you, don’t worry; that’s as technical as today’s Flashback Friday gets. If that line left you wanting a better and more scientific explanation, head over to a post that Donald Simanek, an emeritus professor at Lock Haven University in Pennsylvania, wrote to analyze the physics and mathematics in greater depth. Fred Walter McNair, one of the men involved in the Tamarack experiment. Instead, the men fashioned two “balloons… each ten feet long and built entirely of wood… they were two and one-half feet in diameter at the centre, tapering to a point at either end.” Balloons and piano wire descended together into the No. 2 shaft. When they reached the designated stopping point at the 29th level, the balloons were replaced with “50-pound cast iron bobs… then immersed in engine oil in order to kill all the vibration possible.” Now, data could be collected. The wires had, thanks to the changes in weight as the bobs were replaced and the buoyancy of the engine oil, underground various fluctuations in length. The scientists found these normal, natural, and anticipated. Measuring the distance between the two bobs in the shaft proved more interesting. They hadn’t converged at all. On the contrary, the bobs of the two plumb lines sat 0.07 feet farther from each other than the tops of the lines to which they were attached. What could have caused the strange result? No doubt, experimenters felt excited by this point. To the layperson, 0.07 feet of divergence might seem insignificant; to an engineer expecting the opposite outcome, it was an interesting problem. Later observers would propose a variety of potential solutions: variations in the density of the crust, buoyancy of the oil, geometric quirks, gravitational effects, or mere misinterpretation. Professor Simanek laid out all of them in turn in the aforementioned Lock Haven article, and those wanting to dig into the nitty gritty may enjoy his piece. Suffice to say, however, it took more than casual spitballing over a few cups of coffee to narrow down the cause. 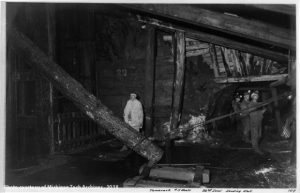 More interesting, perhaps, to the casual Flashback Friday reader is the way in which the Tamarack mine found itself catapulted into conspiracy theories and weird science. After all, mused some, couldn’t the failure of the plumb bobs to converge mean that there was nothing attracting them in the first place? Perhaps the earth was actually hollow. Maybe, instead of being convex, it was actually concave, curving inward beneath the surface. Surely the Tamarack experiment had shown that more was afoot than met the eye. Underground at Tamarack No. 5, circa 1915. Of course, in Houghton County in the peak of the mining boom, there was always more going on underground than met the eye. Imagine the thousands of men roaming the shafts day in and day out, carrying tools and lights and conversing in dozens of languages, meeting those just trying to haul rock and those trying to calculate the convexity of the earth. Perhaps the crossroads of the world were not above it at all but instead a mile below its surface. Snow removal, Houghton, January 1958. It’s been a wild and wacky snow season so far in the Copper Country. We’re beginning to think that Heikki Lunta can’t seem to make up his mind this year. We’ve seen plenty of rain, snow, and wintry mixes out there, which is why we’re taking a moment during our Flashback Friday this week to give a little shout out to all of those who keep the roads and sidewalks clear and safe each winter. 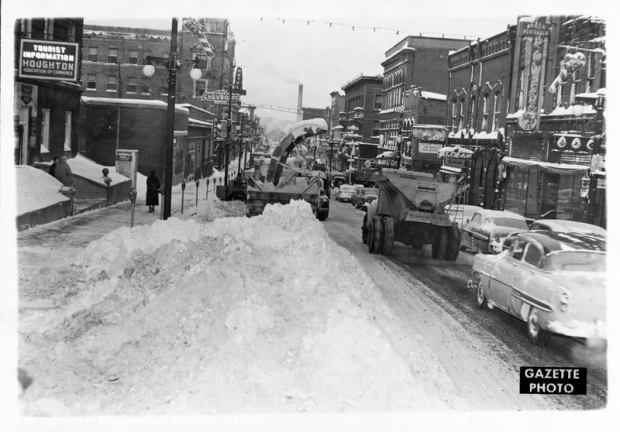 Back in early January 1958 the Daily Mining Gazette ran an article praising the area’s snow removal practices, citing the excellent cleanup effort completed following a “heavy storm that reached blizzard proportions” the first week of the new year. The Gazette noted that the city of Houghton (pictured here) might seem “phenomenal to an outsider” because the streets were cleared almost entirely to the sidewalks, which had also been exceptionally cleared. It’s true that the Copper Country annually sees upwards of 150 to 200 inches of snow and sometimes much more, like the 1978-1979 year where record-high seasonal totals reached 355.90 inches. Big snow means that the Copper Country is also home to some of the most efficient snow removal practices out there. As noted in the Gazette piece, it also means that snow researchers from around the country and the world come to the area to “study local methods and equipment” for snow removal — just think about that during our next big snowfall. Interested in seeing what our latest snowfall totals are for this year? Check out the Keweenaw Research Center’s snow measurements page at http://mtukrc.org/met/weather_snow_data.htm. 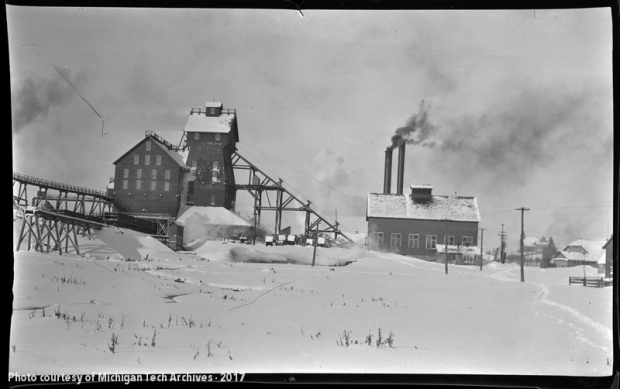 You can also find more amazing snow and snow removal photographs held at the Michigan Tech Archives by visiting our Copper Country Historical Images database at www.cchi.mtu.edu or by visiting the archives during our regular research hours, Monday-Friday, 10 a.m. to 5 p.m. Thank you to all of those who keep our roads clear and accessible each winter and all year round! 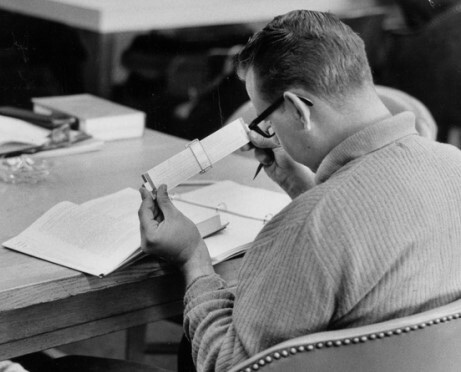 Student studying with a slide rule, undated. It’s hard to believe, but the 2018 fall semester is coming to a close. 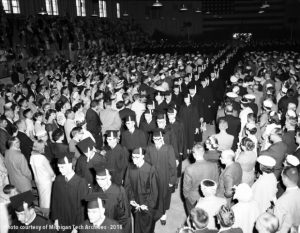 That said, we’re using this week’s Flashback Friday to wish all of our current Huskies the best as they head into finals week and to send out a hearty Michigan Tech Archives congratulations to those graduating this weekend. 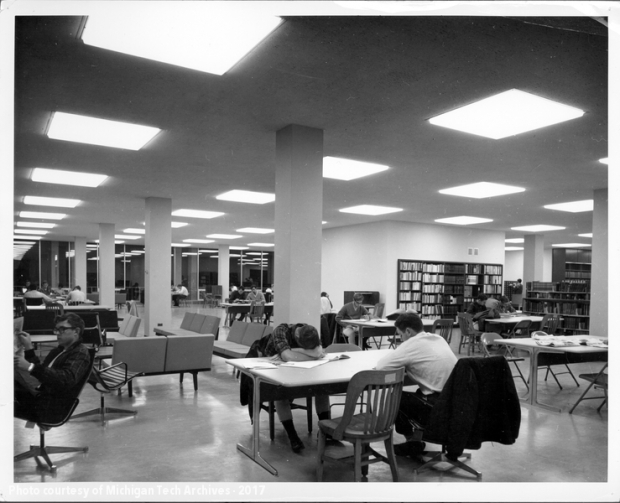 People studying in the J. R. Van Pelt Library, circa 1960s. We know it’s time to hit the books, hand in those last couple of projects, and complete those dreaded final exams before you can head home for the winter break and some much-needed rest. The end is in sight though, Huskies! One more week to go and then you can close the books on the fall semester. Good luck and may the odds be ever in your favor. To all the Huskies taking part in the midyear commencement tomorrow, congrats and best wishes in the next chapter of your lives. Time to show off how crazy smart you are! Creating People’s Park in May 1970. St. Albert the Great University Parish is visible in the background. Saying that life as a young adult in the 1960s and 1970s was challenging would be putting it mildly. While growing into adulthood has always had its difficulties, these decades saw more than their share: political unrest, assassinations, and the death and destruction of the Vietnam War, to name a few. Student activism–protests, sit-ins, strikes–marked college campuses, most notably at places like the University of California, Berkeley, and Kent State University. 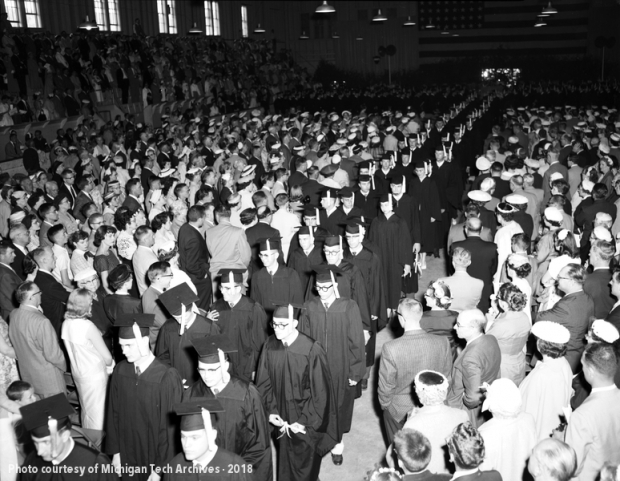 Michigan Tech’s name would rarely, if ever, come up in a conversation about famously political colleges, but students here were still engaged, involved, and prepared to speak up for their convictions. Frustration about the loss of life in Vietnam and in student protests on other campuses boiled over at Michigan Tech in the spring of 1970, leading to uncommon days in Houghton. On the evening of May 6, the Michigan Technological University student council convened to discuss and adopt a special resolution. With the deaths and injuries of thirteen protesters at Kent State University two days earlier, as well as President Richard Nixon’s announcement that the Vietnam War would expand to Cambodia, fresh on their minds, the council members voted 10-6 in favor of a four-day strike from classes. A Daily Mining Gazette article published the next morning quoted the resolution as born of “grief and sympathy for the tragic slayings at Kent State University” and setting “May 7, 8, 11, and 12 as a campus-wide boycott of classes in order to protest the National Guard action at that and other universities and the escalation of the war in Southeast Asia without Congressional consent.” About 500 students in support of the resolution gathered at a rally the next morning, many bearing black mourning armbands and asking for campus flags to be set to half-staff for the duration of the boycott. 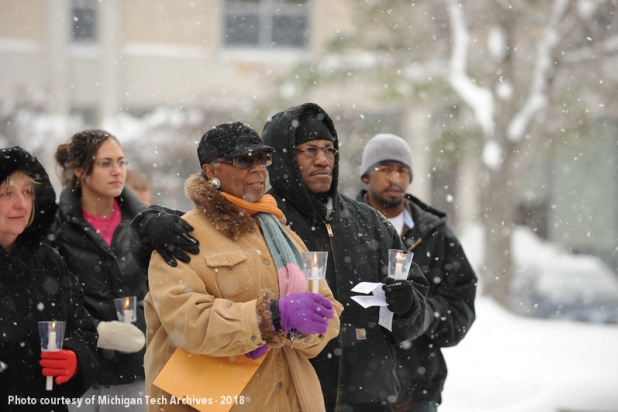 Michigan Tech administrators agreed to lower the flags in tribute to the four killed at Kent State but felt that classes should be held as usual. Professors, while encouraging their pupils to come to class, nevertheless applauded their commitment to democratic, peaceful principles of protest and encouraged the students to write to their senators. 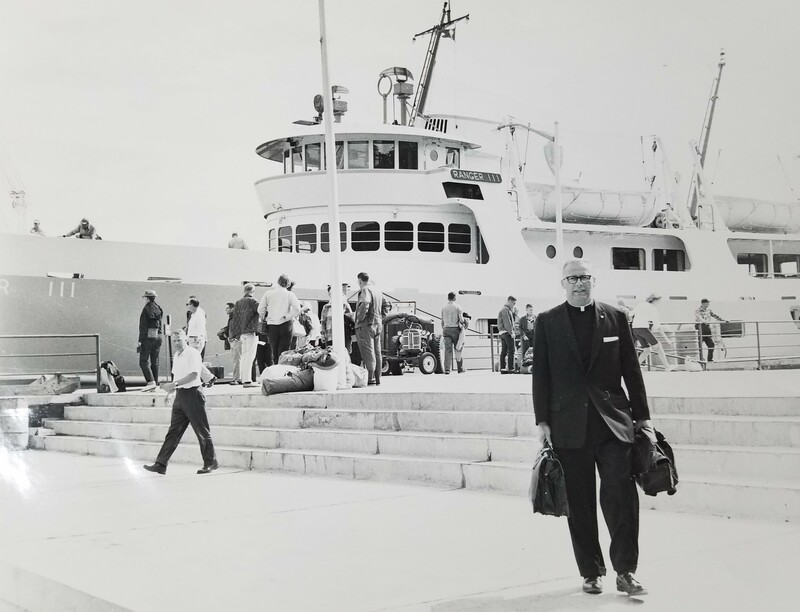 Father William McGee, pastor of St. Albert the Great near campus, took it one step further by warning his young congregation to think carefully about whether to offer their scientific and engineering talents in support of a military-industrial complex. Students take a break from working on People’s Park to meet with President Ray Smith, left, and Vice President Ed Koepel in 1970. To some students, the boycott and lowering of flags did not seem to be enough in the face of so much turmoil in the world. Those gestures, while poignant, would pass, and life would go back to what it was. Instead, they sought to cultivate a lasting good and to express their grief in a constructive fashion. Some traveled to Lansing to meet with Governor William G. Milliken and lobby him for change. Closer to home, part of this expression came in the form of People’s Park, a concept previously proposed and promoted by Fr. McGee. Knowing the desires of students for a meaningful outlet and their concerns for the environment, the priest helped to organize an outdoor work bee on May 9 to clear a parcel of land near his parish in honor of the Kent State dead. By one estimate, over a thousand students participated that Saturday. A group of 300 ROTC cadets, Tech president Ray Smith, and other administrators joined them the following Tuesday. Their dedicated efforts even attracted the attention of Russell Hellman, the state representative for the 110th Michigan district, who read an article about the park’s construction into the record of the State House of Representatives. Fr. William McGee, a staunch advocate of People’s Park, in front of the Ranger III. Photograph courtesy of St. Albert the Great University Parish and Fr. Ben Hasse. These days, People’s Park is no longer a gathering place for Tech students or the local community. 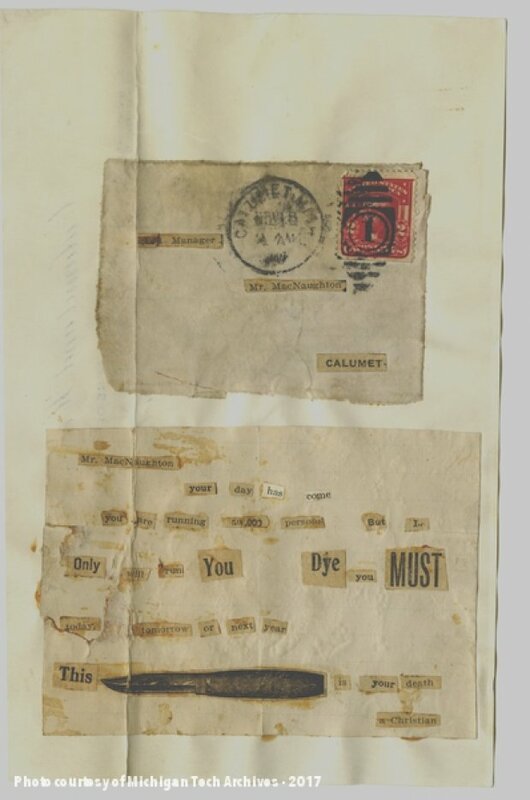 By 1982, campus alternative paper The Student Ego noted that the park had fallen into noticeable disrepair. Industrial equipment hauled from a local copper mine as decoration had begun to decay. Fr. McGee, the champion of People’s Park, had left Houghton years before and focused his attention elsewhere. In his absence and with little support from the student body–which drew the vocal ire of a 1970 boycott participant in the aforementioned Ego article–the protest memorial faded away, reclaimed by the elements. Later, to paraphase Joni Mitchell, they paved People’s Park and put up a parking lot, which now serves students during the week and St. Albert the Great parishioners on weekends.